Xerox dealer Stanford Marsh Group Graphics (SMGG) is to unveil a pre-production prototype of the new high speed wide format production printer from Xerox that is powered by Memjet's waterfall print head technology for the graphics/signage market on its stand at the upcoming Sign & Digital show later this month. The printer first made its debut on the Caldera stand as a technology demo at Drupa last year following a Fujifilm and Xerox joint venture to develop a 1,066mm (42in) wide, roll-fed, aqueous inkjet single-pass printer that can print 85gsm coated stock to much heavier canvas and polyester-based stocks. Caldera's RIP is a key part of the equation as it is responsible for keeping pace with the very high data rate that is required to run the 1,600dpi printer at its 9m/min running speed. Watch the Xerox technology video below showing the full power of this ultra fast machine. Xerox, which is responsible for Fuji Xerox sales in the US, Europe and some emerging markets, is understood to be targeting the device much more towards graphic arts production and that the company was aiming for a 2013 launch in the US, Europe and emerging markets. Matt Perkins, director of Stanford Marsh, says: "We've been deepening our strategic focus into the graphics industry and have been heavily investing in the sign and display space. 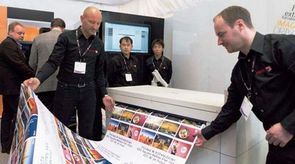 The Sign & Digital event offers us an ideal opportunity to showcase our wide range of print solutions to this market." SMGG offers a broad solutions portfolio providing customers with in-house manufacturer-led service support, hardware and software sales of brands including Canon, Epson, HP, Océ, Ricoh and Xerox.